Tekken 2 was one of the greatest 3D beat ‘em ups ever released. Published by Namco it first appeared in the arcades in 1995 and pit players against each other in a vicious battle for victory. The popular Playstation version was released the following year and marked a progression for the genre adding depth to the established game-play of classics like Street Fighter 2. 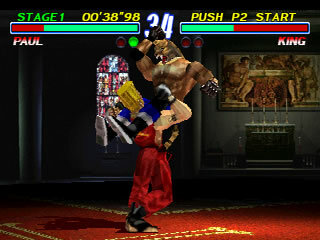 The Tekken series was one of the first to convert the fighting action to 3D along with the popular Virtua Fighter series but Tekken offered superior game-play and depth. The second in the Tekken series introduced a number of new characters and moves and it was the must have fighting game of the time. Players could choose from a stunning array of over 20 characters each with unique fighting styles and complex combinations which could be layered to unleash strings of ferocious attacks. The fluid game-play was a real winner with gamers and the beautifully modelled 3D characters each had their own background and offered a genuinely different game-play experience. Battles were fought on a variety of detailed 2D backdrops sometimes with moving elements and the lighting system was impressive for the time. Players competed to become champion of the Iron Fist tournament. Each character had their own motivation for taking part and there were a number of baddie bosses to overcome including the Devil himself. The game-play had a stunning level of depth to it and focussed on real combat moves as opposed to fireball attacks and the like. In addition to basic punches and kicks there were a wide variety of throws and counter throws and your speed and direction modified your basic attacks to create a feeling of infinite possibilities. Buttons corresponded to various limbs and the combat system dispensed with the need for speed instead forcing the player to consider the rhythm of their attack and introducing the ability to deceive players with dummy attacks and moves which disguised the real punch or kick. Certain moves, hit at a certain time, can do huge damage. You could choose from ten characters at the start with a further thirteen unlockable characters. They ranged from the Japanese Heihachi, to the American Paul Phoenix and even the bizarrely Irish Nina Williams. All of the characters were extremely well realised and the game-play allowed new players to plug straight into the action but like all good fighting games it took several hours to realise the full potential of each character. While familiar concepts were retained the game placed a focus on combination moves where you could string together a series of attacks to unleash up to ten in a fluid flurry of pain. The challenging single player progression was great fun to play through but the real replay factor came from the multiplayer battles and with such a wide variety of characters to choose from everyone had their own personal favourite. Mine was undoubtedly Lei Wulong who was obviously based on Jackie Chan and he was imbued with fighting styles from some of Jackie’s greatest movies specifically The Drunken Master and Snake in Eagle’s Shadow. The ability to fight in the drunken master stance was a terrific inclusion and the unpredictable nature of his drunken moves brought me many victories. 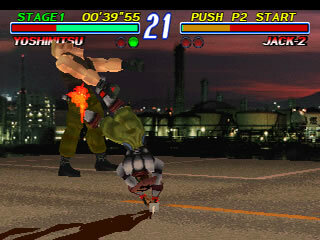 Tekken 2 marked a real advancement for the fighting game genre both in terms of graphics and game-play. It was hugely popular and a deserved inheritor of the beat ‘em up crown which Street Fighter 2 had held for a number of years. Fighting games have progressed little since Tekken 2 and it still plays extremely well by modern standards.